Beautifully crafted in the style of a glittering three-dimensional astrolabe or celestial object d’art, De Beers’ Wondrous Sphere incorporates 476 polished and rough diamonds placed on orbiting white gold rings articulated around a 13.17-carat olive green rough diamond. That center diamond took De Beers chief diamond buyer Andrew Coxon nine-months to find, “and I can’t tell you how many I discounted during my search!” says Coxon, who is the president of the De Beers Institute of Diamonds. “The design required a rough diamond of stature and beauty,” Coxon explains, adding the diamond would have probably go straight to the polishing wheel if he hadn’t “rescued” it. Natural Vivid Green diamonds are the second-rarest diamonds to be found naturally— Fancy Red diamonds being the rarest— says Coxon who has bought and sold some of the world’s most famous and largest diamonds including the 59.60-carat CTF Pink that came from a 132.5-carat rough diamond mined by De Beers in 1999 and which was bought by jewelry retailer Chow Tai Fook at Sotheby’s Hong Kong last April, setting a new world auction record for any diamond at $71.2 million or 1.19 million a carat. The previous year (2016), Chow Tai Fook set the auction world record for a Fancy Vivid green diamond, when it bought the “Aurora Green, for $16.8 million or $3.3 million per carat. At 5.03-carat the Aurora Green was a fraction of the size of the CTF yet achieved a much higher per carat price, attesting to buyers’ demand was such rare stone. It was also the largest Fancy Vivid green diamond ever sold at auction, attesting to the rarity of the most sought-after saturated color amongst green diamonds. While other colored diamonds form as a result of a "contamination" in the carbon crystal (such as boron for blues and nitrogen for yellows), the green color results from millions of years of exposure to natural radiation beneath the surface of the earth. The largest and perhaps finest natural green diamond known is the 40.7-carat Dresden Green, a pear-shaped diamond first acquired by Frederick Augustus II, King of Poland from a Dutch merchant in 1741, and it now resides permanently in the Green Vault of the Dresden Royal Palace. The second largest green diamond, the Gruosi, is owned by De Grisogono and it weighs 25 carats. 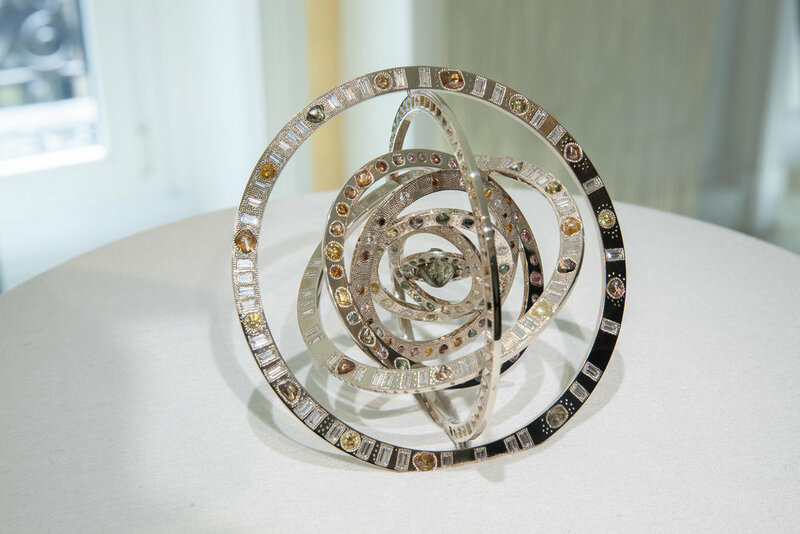 It is set in a gold ring bedazzled with 282 black diamonds created by the Swiss luxury jeweler. The majority of naturally irradiated diamonds only maintain their green coloring on the surface (also known as ‘skins’) and often loose that rare color during the cutting process, with only a very small number exposed to radiation long enough exhibit an even green hue throughout the entire crystal. Among these rare stones very few have a pure Fancy Green color with most green diamonds containing a modifying hue (bluish, greyish or yellowish), that will greatly affect the pricing of the stone. 1.17ct Natural Fancy Vivid Green diamond and 3.84cts diamond ring, set in platinum. “The most attractive modifier is the blue green. They can have a wonderful Caribbean Sea color. For me, as a professional, I actually prefer those to the straight vivid green because it has a warmer hue. But it’s not as rare as the vivid green. The least valuable are the grayish yellowish green diamonds, which are actually very affordable. You could buy a 3-carat grayish yellowish green for US$15,000-20,000 per carat,” explains Graeme Thompson, Bonhams’ Director of Jewelry in Asia. Thompson says the market for green diamonds is “very much in Asia,” because the color is considered auspicious by Asian buyers who already have a long tradition of appreciating Jadeite. That Asian interest has been noted by Alisa Moussaieff, the 88-year old driving force of the London-based Moussaieff Jewellers who says that in recent years, Asian jewelry lovers have become “more and more discerning when it comes to the finer points in colored diamonds.” The high-end jeweler point out “the color of green diamonds is extremely versatile and combines really well with other colors in diamonds.” Moussaieff likes to pair green diamonds with pink diamonds in her creations. Prices for green diamonds have been rising, but collectors also need to be cautious and buy with their “eyes and heart,” as well as the backing of a certificate from a body such as the Gemological Institute of America (GIA), says Thompson. While natural green diamonds are extremely rare, the color can be reproduced artificially so convincingly that it can be difficult for a seasoned jeweler to distinguish between a natural green diamond and one artificially treated. To reassure buyers, the GIA has developed thorough, in-depth lab tests that manage to rule decisively whether the diamond's green color was created in a natural or artificial process. “Very few green diamonds pass the stringent tests,” says Coxon, adding that it has now become a requirement to show the original rough diamond to the diamond grading laboratory for them to examine its original Green skin, before it is partially polished away in the manufacturing process. “Never buy any Fancy Coloured diamond which does not have a recent GIA diamond grading report and which is not sourced for you by a trusted brand with undoubted expertise,” Coxon advices.